With uncertainty looming large over the prospects of an international airport coming up at Ladhowal on the city outskirts, the land prices have started crashing in areas in the periphery. The land prices in these areas had shot up phenomenally after the proposal came up for setting up an international airport there. The father of an alleged mentally challenged youth, who was a victim of a fraud played on him by his friends and was got sterilised at the Civil Hospital in October, is a deeply pained man today. First, he suffered the shock of the operation of his son, then the police inaction after his complaint. 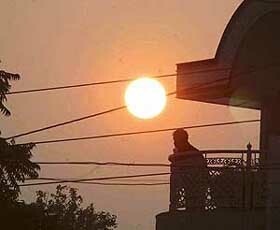 The Punjab State Electricity Board (PSEB) is grossly overstaffed. The number of PSEB employees per 1,000 customers is among the highest in comparison to electricity boards of other states. Whereas the Kerala State Electricity Board has 4.20 employees per 1,000 customers, this number is almost four times more, 16.90, in case of the PSEB. An elderly couple caught a robber trying to loot them at gunpoint on Saturday night. Later other residents handed over the robber to the police. The draw of lots of 90 flats of the Shaheed Bhagat Singh Nagar Housing Complex, Phase-II, conducted by HOUSEFED passed off peacefully today. The Payal police registered a case under the Dowry Act against a father and son duo of Ghaga village in Samana tehsil here today. Mandeep Kumar (18) was killed when a loader truck hit his scooter near Ambey Majra village, 2 km from here, on the G.T. Road yesterday. 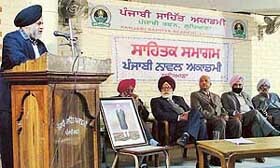 The controversial issue of 1,500 square yards of land of an elite club in the city resurfaced at a function organised to celebrate the 106th birth anniversary of Shaheed-e-Azam Udham Singh when the city-based Shaheed Udham Singh Trust resolved that it would not relax till it get a memorial and a library set up in the memory of the martyr in the city. POLITICAL interference in the Army started when Mr Krishna Menon was the Defence Minister in the 1950s. Its shattering fallout in the 1962 war was too obvious to be missed. This interference coupled with favouritism continued to grow over the years. 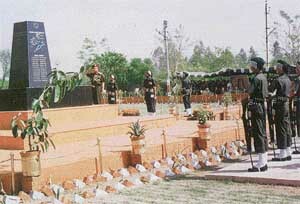 Homage being paid to the war heroes at the Sehjra Memorial in Ferozepore. The beacon of education of Mandi Ahmedgarh and the founder of Sanatan Vidya Mandir Senior Secondary School and Sacred Soul Public School, Data Ram Sharma, died after prolonged illness here today. The Raikot police with the arrest of Kamaljit Singh, alias Kala, claimed to have solved the murder of Aas Kaur, 85, of Jalaldiwal. Earlier the police had arrested Kamaljit Singh’s wife Balwinder Kaur, alias Binder. Ms Jitender Walia, Sub-Divisional Judicial Magistrate, today sent Kamaljit Singh to one day’s police remand. 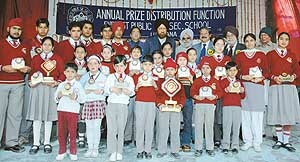 The 35th annual prize distribution function of Everest Punjab Senior Secondary School, Moti Nagar, was held here today. The Punjabi Novel Akademy organised a literary seminar at Punjabi Bhavan here today. 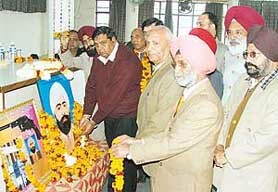 The function was organised to pay homage to novelist Nanak Singh on his death anniversary as well. The chief guest was Dr Katar Singh Suri, son of Nanak Singh. Mr Kulbir Singh Suri, another son of Nanak Singh, also participated. “It has been shown that more heart attacks occur during winter months, in the mornings and on Mondays.” This was stated by Dr Arun Kochar, interventional cardiologist, Fortis Hospital, Mohali, in the wake of the cold wave that has enveloped the region. Dr Harpal Singh, Assistant Professor in the Department of Orthopaedics at Dayanand Medical College and Hospital, recently attended a three-day comprehensive bioskill workshop at Orthopaedic Learning Centre at Chinese University in Hong Kong. The Punjab Medical Representative Association (PMRA) conducted a session on health issues at a workshop organised for 110 teachers of RS Model Senior Secondary School and BCM School, Jamalpur, here today.